It’s that time of year when everyone in the house has been “cutting back” after the holidays and trying to stick to new, healthier regimes. My New Year’s resolution was walking a mile and a half every day. Why a mile and a half? Because last year my resolution was to walk a mile every day and, I’m proud to say that I actually did it! It wasn’t easy because I live in the North East and walking outside in the winter can be treacherous most of the time (take it from one who’s a “frequent faller” on ice). Mall walking is great but I live too far from a mall to waste time and gas to drive there. My solution is walking in circles around the periphery isles of Home Depot or BJ’s Wholesale club which are a short distance from the house. Sometimes I’ll even use Whole Foods for my exercise track but it takes more laps around the place. I use the pedometer iPhone app to know how I’m doing but, in general, it takes six orbits around my track to to reach this goal. It’s not only a good work out for the body but for willpower as well. To any shopper, there’s the desire to stop and check some new product that catches your eye but that has to wait until I’m done with my mile and a half. 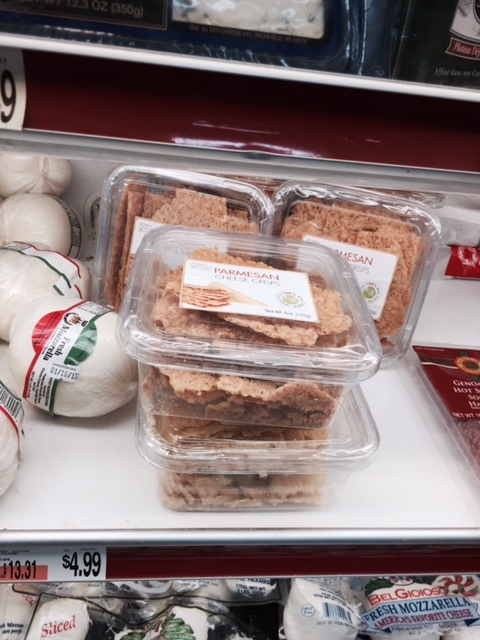 One of my favorite discoveries this year has been ready made Parmesan crisps. These have always elevated any Caesar salad to a whole new level and if you skip the croutons it makes a perfect meal for anyone who’s doing Paleo or low carb (as so many are in the bleak month of January). 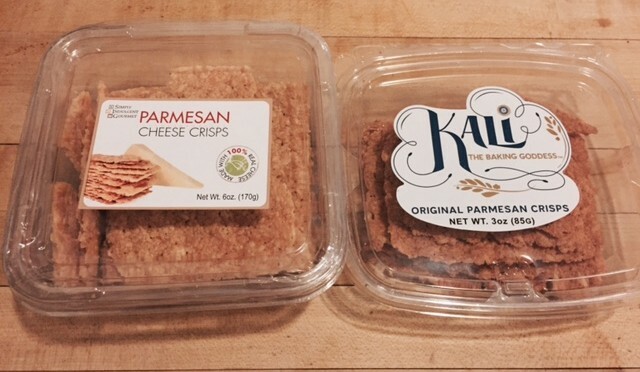 Parmesan crisps are very basic and simple to make. You just bake grated piles of Parmesan cheese on baking sheets until they form crispy, lacy wafers— but when I’ve been walking for miles, I get lazy and would much rather pick up a box. To my delight, I have stumbled upon two excellent brands. 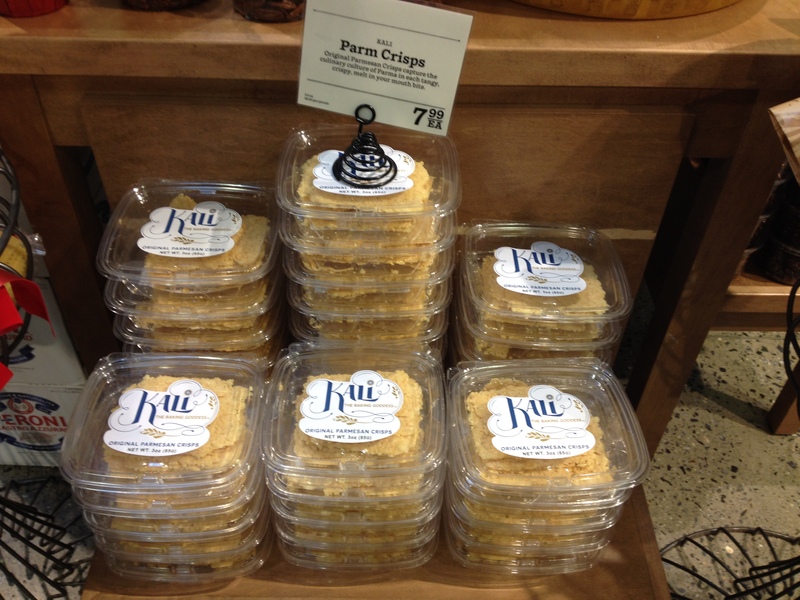 I first came across these Kali Parmesan Crisps for $7.99 at whole foods. About a month later I noticed these Simply Indulgent Gourmet Parmasan Cheese Crisps at BJ’s Wholesale club for $4.99. 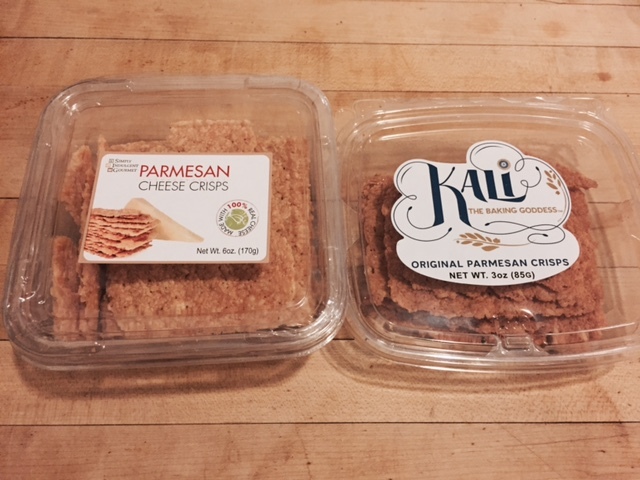 Both products are excellent and the only real difference is that the Simply Indulgent Gourmet Parmesan Crisps contain a trace of potato starch and their label list having 1 carbohydrate per serving as opposed to Kali’s 0 carbohydrate per serving but it a savings of three bucks so it’s a matter of which matters most to you. So how do I use these things? On salads and soups of course. They are even a good dip dipper if you are off of eating chips. My go to favorite will always be a Caesar salad. 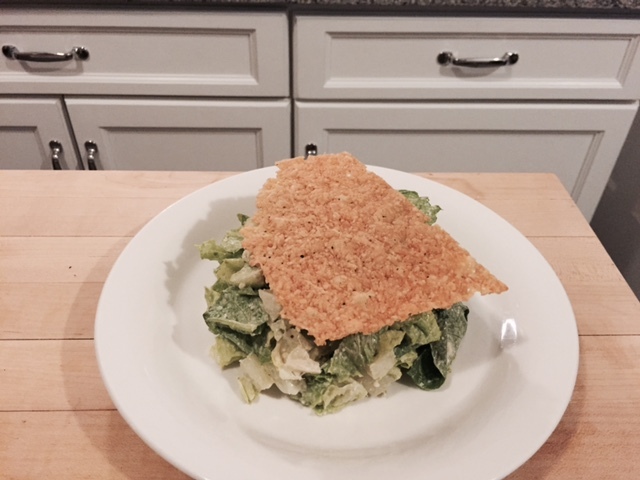 I like to do my chopped style– where you toss the romaine with dressing, pack it into a bowl, invert it on your plate and garnish with a Parmesan crisp– a totally guiltless pleasure. Which brand of Parmesan crisp do you get at Home Depot?